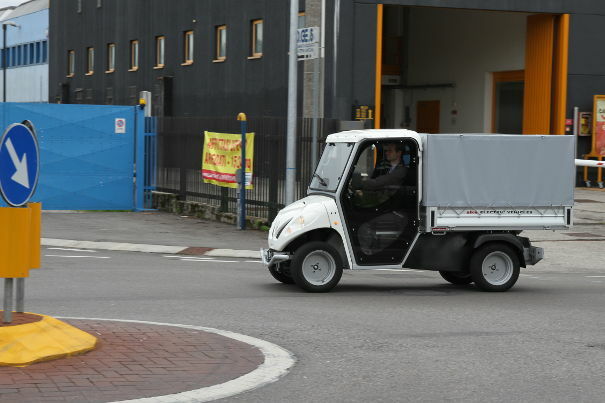 Alke electric express delivery vehicles are the ideal solution for couriers. They come in a number of versions and permit access to any part of the city or its historical centre. Delivering goods in historical city centres is often a problem for couriers. Narrow streets, lack of parking and traffic restriction regulations are all critical factors that a courier has to take into consideration when attempting to meet a client's needs. Not to mention deliveries in places like hospitals and holiday villages, where access with a normal van is often difficult owing to limited manoeuvring room and the geographical location (often very attractive to the eye, but something of a problem when it comes to the practical aspects). That's why more and more express couriers are converting or extending their transport fleet to electric vehicles. 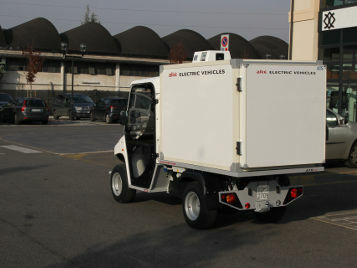 Alkè has an entire line of electric vehicles that are small and manageable, tailor-made to meet delivery service needs. With Alkè's electric vehicles for express couriers, goods can be delivered anywhere with the utmost ease and safety - even those places that are particularly hard to reach. When you choose an Alkè vehicle, you'll save time and money because fuel costs are drastically cut. In addition, the braking energy recovery system reduces fuel consumption even further during the frequent stop & go manoeuvres. Equipping yourself with a fleet of electric delivery vehicles will limit your running costs and increase the quality of the service you provide. The range of Alke's zero-emission vehicles covers an entire working day without problems, even when frequent pauses are needed for loading and unloading operations - as in the case of couriers. If continuous use is called for, removable batteries (acid lead or gel) can be fitted in the space of just a few minutes. There's also a version with lithium batteries that can be recharged with specific, fast battery charge sets (a complete charge in 1.5 hours or 2.6 hours, depending on the capacity of the battery chosen), increasing vehicle autonomy up to 150km. Numerous fittings are available for your delivery work, even for perishable goods like fruit and vegetables or other fresh products. 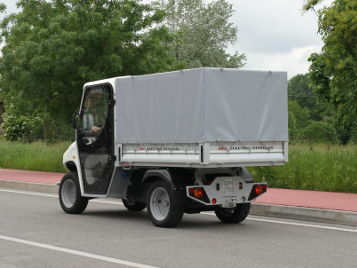 Depending on your requirements, an Alkè electric express delivery vehicle can be fitted out with a closed cargo bed with sliding side doors for easy loading/unloading. It can be thermally insulated, or, if you prefer, it can just have a simple body tarp. For products for which the cold chain is fundamental, there's the refrigerated container option that maintains a temperature between 0 and +4C°. 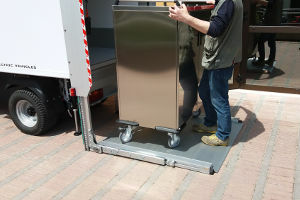 The isothermal cargo bed can also be fitted with a rear tail lift for easily and safely loading or unloading heavy, bulky items like the trolleys for distributing meals in hospitals. The lift has a load capacity of up to 500kg. 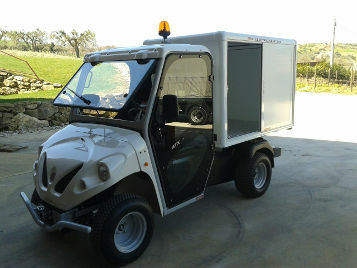 Thanks to the Alkè electric express delivery vehicles, consignments can be made in all restricted traffic areas, and without being limited to certain times of the day. Their compact size ensures easy access, even to areas that are hard to reach. All our vehicles are purposely designed to guarantee the best possible load capacity. The optimum power of the Alkè electric motor means the vehicles can handle steep slopes and uneven or rugged road surfaces.